This battery pack comes with a 36V 29Ah (1044 Watt-hour) super high capacity light weight rechargeable lithium ion battery and a 36V to 19V DC Converter that converts the battery power to 19V DC power. Although this battery's capacity is over 1000 Watt-hours, its only weighs around 13 pounds. A similar Lead Acid Battery will weigh over 50 pounds. The output cable has one end that is two ring connectors that can be easily connected to the battery's output terminals. The other end has a Anderson Powerpole connector that can be easily connected to an inverter or other devices. This battery comes with its own AC charger that can charge the battery from any 110V ~ 240V AC power source. It can fully charge the battery in 5 ~ 6 hours. This DC to DC power adapter's input side has two 16AWG bare wires. The output is a 5.5 x 2.5mm male barrel connector with 16AWG wires. It is very easy and flexible to connect with batteries and other power source. Input: The red color is for Positive input and the black color is for Negative/Ground input. It is CRITICAL that the power adapter is connected correctly in polarity to the power source: Positive on adapter connects to Positive on power source. Negative on adapter connects to Negative on power source. FAILURE TO DO SO MAY RESULT IN SEVERE DAMAGES. Output: The output connector is a 5.5 x 2.5mm male barrel connector. This connector can only handle 10A current for a short period of time. It is recommended for use with a continuous current 6A ( 120W) or less. Most laptop computers that come with a 180W to 240W power adapter actually need less than 120W of power most of the time. *10A is its maximum output current, not actual output current. Actual output current depends on the device's requirements. For example, if your device requires 2 Amps, it will output 2 Amps. 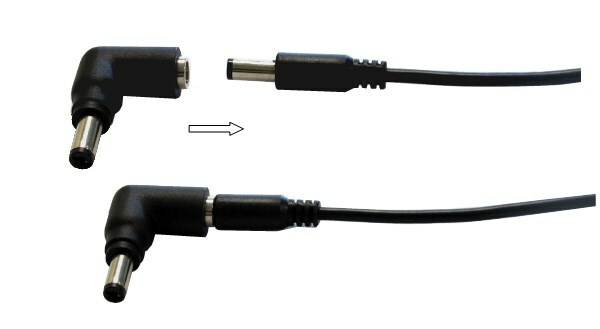 The connector on the power adapter output cable is a 5.5 x 2.5mm male barrel connector, which will work with many devices. If you need different size connectors, you may order our separately. A C series connector can plug on the battery output cable to form a new connector. 1. One HL3633B battery: 36V 29Ah, or 1044 Watt-hour.